Creating a floral arrangement can be intimidating. Much like keeping houseplants alive, a lot of people just assume they don’t have a knack for it. 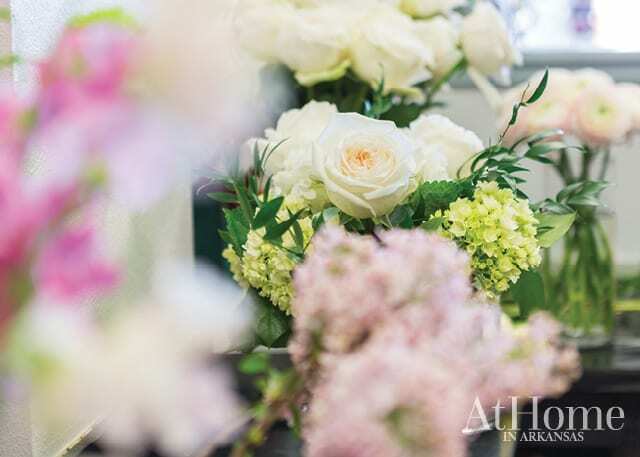 But according to Mary Grace McCauley at Pigmint Floral Studio in Fayetteville, anyone can master the art—you just need to know the basics and give it a try. 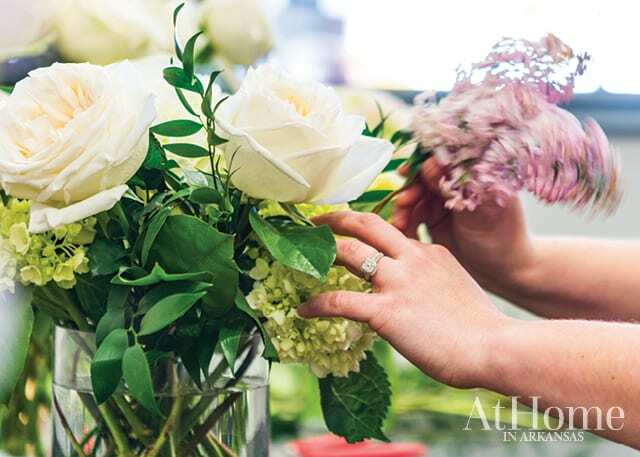 Next time you’re faced with a bunch of stems and an empty vase, call on Mary Grace’s words of wisdom to guide you to a gorgeous arrangement. “The most important step is ‘greening the vase,’ because that builds your support for your flower arrangement,” Mary Grace says. To accomplish this, she alternates laying stems of salal and Italian Ruscus, Pigmint’s signature greens, across the vessel. 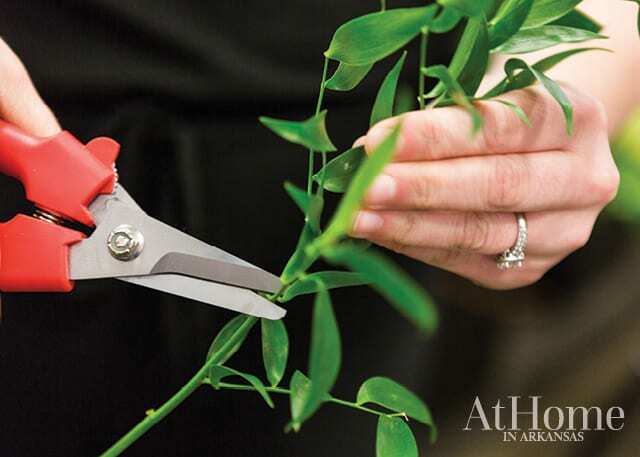 “You want to think about building an armature that’s going to hold up your flower stems,” she says. 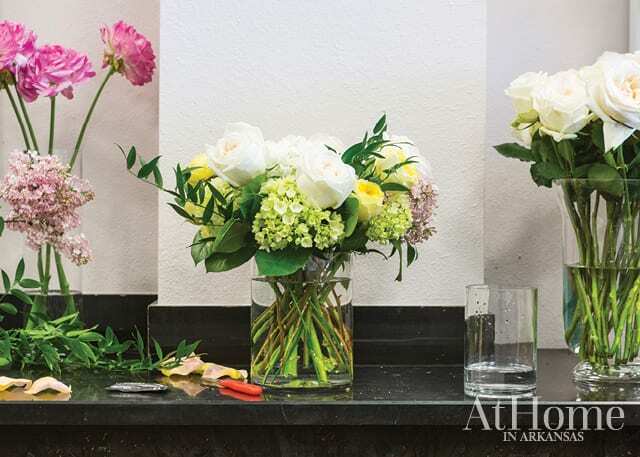 After greening, move on to adding larger blooms that sit low and cover the rim of the vase. 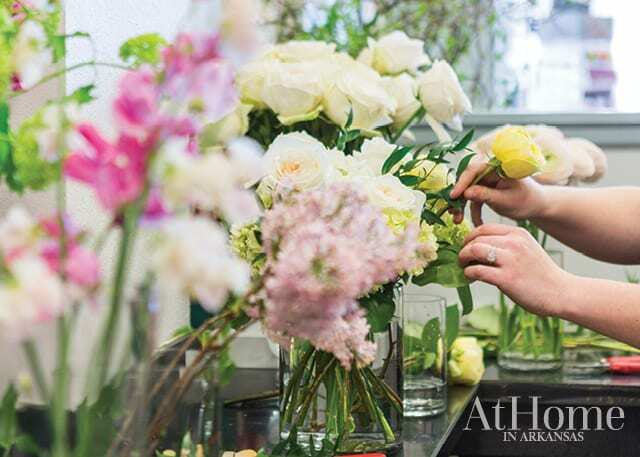 “I put my larger focal flowers in first so I get an idea of the shape, then I fill in with the smaller things with smaller stems,” Mary Grace says. 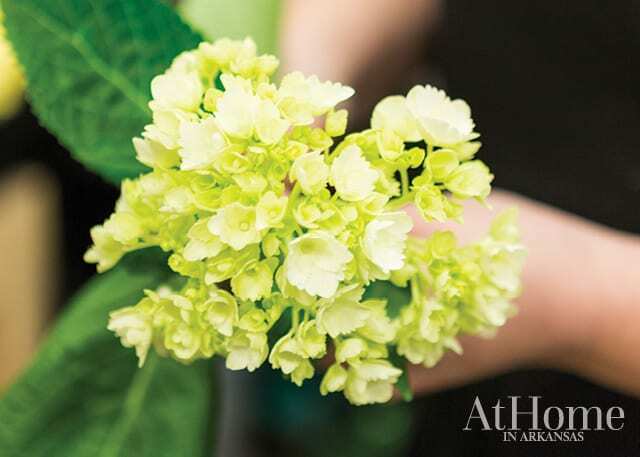 She starts with hydrangeas, and then adds in O’hara roses, Catalina roses, and Japanese ranunculi. Finally, fill in with smaller blooms. 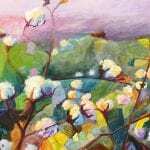 “A great idea is to look at the natural shape of the flowers,” Mary Grace says. 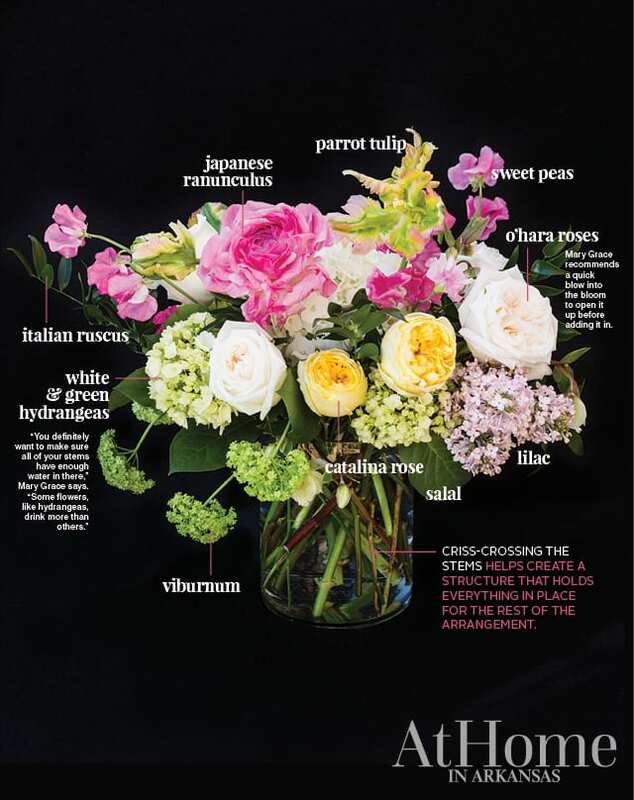 “Flowers like roses will come in with really straight stems, but some of the more unique, more special flowers have some really beautiful curves to the stem. I try to take a look at which direction they go naturally and work with the shape instead of against it.” This is the time to add texture. 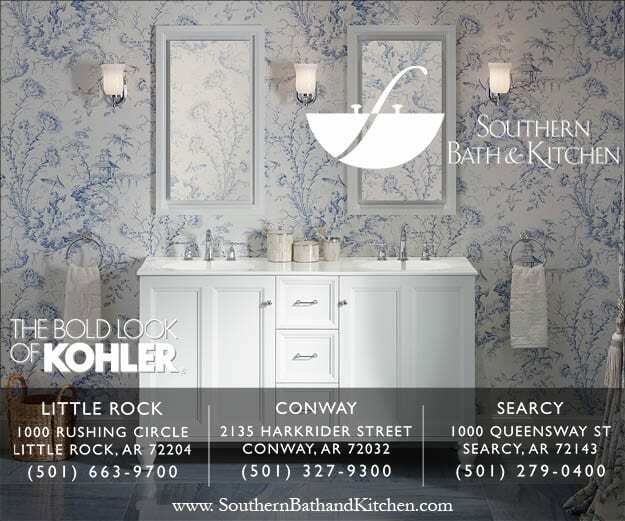 If your base blooms are straight and structured, consider adding something light and airy in the final touches. 1. Start with a clean container. Bacteria equals a bad environment for keeping flowers fresh. 2. 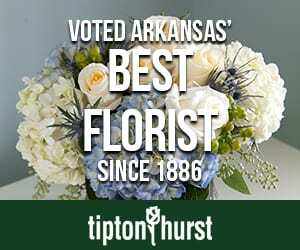 Use flower food, which can be found at your local florist or online. 3. Dip your stems in a hydrating treatment, like Floralife Quick Dip, after each snip. 4. Trim any leaves below the water line. This is to keep water fresh and free of bacteria. 5. Finish with a protecting spray, like Floralife Clear Crowning Glory, to help preserve cut flowers. 6. Change the water in your finished arrangement and give your stems a fresh cut every couple of days. Sign up for a class at Pigmint, where all materials are provided and a pro like Mary Grace will guide you through the process. 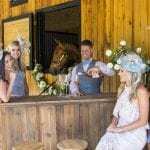 Check shoppigmint.com for details and class updates.